Modders resurrect the classic Half-Life expansion pack in the Source engine. 1998 was a good year for games. Fallout 2, Grim Fandango, Zelda: Ocarina of TIme, Baldur's Gate and Half Life all saw release. Each of these games have achieved some form of immortality, whether though official rereleases or though fan dedication. 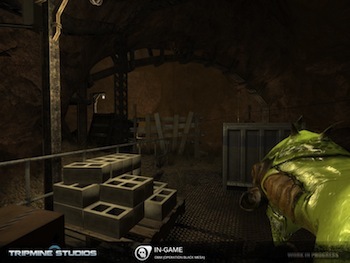 Last year, (most of) the original Half-Life was revived thanks to Black Mesa. Now, a different mod squad called Tripmine is looking to recreate all the other bits and pieces of the Half-Life continuum, starting with the Opposing Force expansion pack. Entitled Operation Black Mesa, the team aims to recreate all original 12 chapters using the 2007 Source SDK, as well as expanding it with new areas and monsters.The team is currently planning on a multiplayer release in the first quarter of 2014. The single player portion currently doesn't have a release window yet. Originally developed by a pre-Borderlands Gearbox, Opposing Force put a twist on Half-Life by having you play Adrien Shepard (no relation to the beloved commander), who's a marine tasked with cleaning up the Black Mesa mess with bullets and bombs. It was notable for it's many new weapons and aliens, some of which doubled as weapons themselves. The project is also up for a Steam Greenlight, so make sure that you vote if you're interested. Tripmine also has Guard Duty in the works, a rerelease of the Blue Shift expansion pack, which is still in the early stages of development.